Defence Career Group provides the Best AFCAT Coaching in Chandigarh by expert trainers. We train student at our AFCAT Coaching Institutes, Centers and Classes in Delhi for cracking AFACT EKT Exam. Indian Air Force holds AFCAT to select officers in different IAF branches namely – Ground Duty Branch, Flying Branch (Short Service Commission) and Technical Branch (Short Service Commission and Permanent Service Commission). Medical and Dental Officers are not selected through AFCAT. Defence Career Group offers regular AFCAT Coaching & Training to students and nourishes their ambitions in the positive energy to help them become officers in Indian Air Force. We train students to appear in AFCAT with complete preparation. Defence Career Group is the key to tackle AFCAT successfully. Graduation from Recognized University in any stream. Candidates who have passed Examination of Associate Membership Section – A and Section – B of Institute of Electronics & Telecommunication Engineers. Candidates who have passed Examination of Associate Membership Section – A and Section – B ofInstitution of Engineers or Aeronautical Society of India. AFCAT EKT Stands for Engineering Knowledge Test. This exam is based on basic engineering concepts along with AFCAT exam for Technical Department of IAF (Indian Air force). Students those want to Join Indian Air force Technical department appear in AFCAT EKT exam. Defence Career Group is only institute who provides Best AFCAT coaching in Delhi. So if you preparing for AFCAT (Airforce Commen Admission Test ) EKT Exam then Defence Career Group is best option for you. We have different department of skilled teachers those prepare students for EKT ( Engineering Knowledge Test) exam separately. Our Teachers cover all the syllabus that comes under the AFCAT EKT Exam along with full study material. 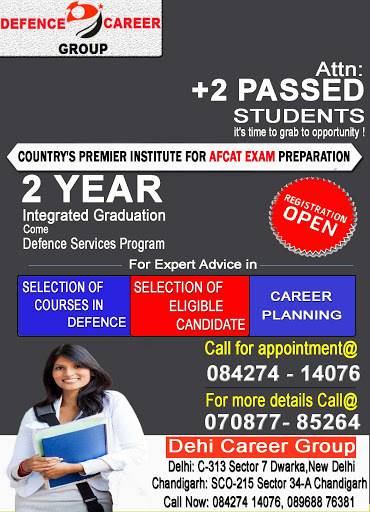 Thus DCA is the best option for AFCAT Coaching in Chandigarh. Defence Career Group is the renowned Institute For AFCAT EKT Exam Coaching in Chandigarh & Delhi. We prepare the students Defence Career Group was founded as a specialized centre with a view to become a bench-mark institution for providing the best AFCAT EKT coaching in Delhi. Our academy aims to build competitive skills among the students with strong academic base with quality teaching. Key deliverable by Defence Career Group – AFCAT Coaching in Chandigarh & Delhi. • Reliable Study materials from authorized and recognized sources. • Practice from previous year papers and model papers too. EKT stands for Engineering Knowledge Test along with AFACT this test is conducted by Indian Air Force, to judge the basic understanding of engineering students applying for air force. This test has been made as a part of AFACT exam from on wards. After taking AFCAT written exam of 2 hours this paper gets started. It contains questions related to the basic concepts of engineering and a candidate having thorough understanding of the basics will be able to solve this easily. Part B- specialized Paper contains the questions related to the specific degree of the candidate and the questions will be asked from the field of specialization. The specialization areas are: Mechanical Engineering, Electronics and Communication Engineering, Electrical and Instrumentation Engineering, Aeronautical Engineering, and Computer Engineering. FAQ1 What is EKT exam? EKT stands for Engineering Knowledge Test along with AFACT this test is conducted by Indian Air Force, to judge the basic understanding of engineering students applying for air force. This test has been made as a part of AFACT exam from 2014 on wards. FAQ2 Who has to give Engineering Knowledge Test? Engineering graduates who are applying for the Technical Entries through the AFCAT exam have to take this exam along with AFCAT exam. Thus candidates appearing AFCAT have to pass this test along with the written test. FAQ3 What does Engineering Knowledge Test contains? This test will consist of objective questions related to the basic concepts of engineering. The questions will be asked from the multiple branches of engineering to check the basic understanding and clarity of the basics. Candidates can check the syllabus for EKT on our website. FAQ4 When does EKT Engineering Knowledge Test takes place? FAQ5 What is the time duration of EKT Engineering Knowledge Test? EKT will be an objective test of 45 minutes duration after taking 2 hours of AFCAT exam. FAQ6 Does Defence Career Group offer online study materials? Yes, we offer free online/offline study materials, mock tests, etc. Quality material is provided to the candidate who joins coaching for AFCAT EKT preparation. Defence Career Group provides best AFCAT Coaching in Chandigarh & Delhi. WHY DEFENCE CAREER GROUP for AFCAT Coaching? DEFENCE CAREER GROUP gives POWER TO YOU! AFCAT is easy to knockout. NDA Coaching in Chandigarh Enrol Now ! !